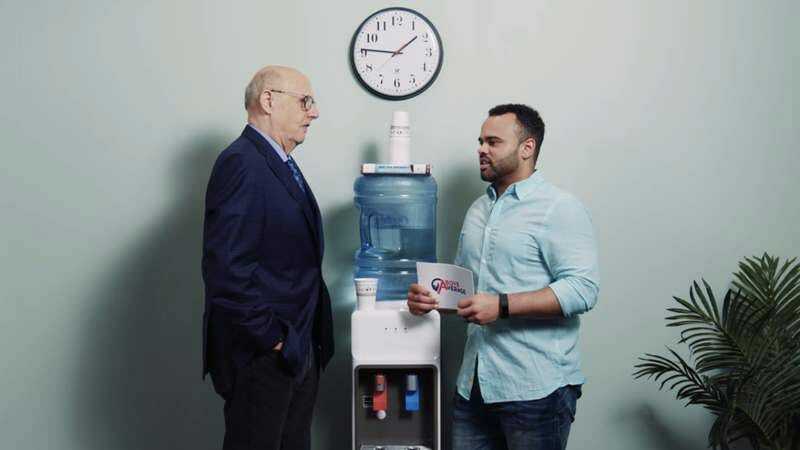 Above Average’s “Your Biggest Fan” web series is a modern riff on Saturday Night Live’s “The Chris Farley Show”, with comedian Rob King cornering various celebrities at a water cooler to accost them with banal questions and pathetic demands. His latest target is actor Jeffrey Tambor, whose cries for security go unheard before King launches into a barrage of questions about the actor’s career, catchphrases, and, of course, his new book, Are You Anybody?. Hey, his kids might not care about it, but King sure does. The three-minute clip tells a whole story, with Tambor’s bug-eyed fear slowly evolving into cautious fan service (he dutifully recites catchphrases from each of his signature shows) and, eventually, a paternal sweetness, to which a bedfuddled King responds to like a deer in headlights. “We’ll probably be doing some wall stuff,” he says of the Netflix’s forthcoming fifth season of Arrested Development, a revelation that, given our current political climate, is about the biggest “duh” possible. Regardless, it’ll be interesting to see what Tambor and the rest of the Arrested Development team do with a new incompetent scion of American industry as their muse.